HEARTS celebrated winning the league title with a comfortable win over Queen of the South thanks to goals by Osman Sow and Alim Ozturk. 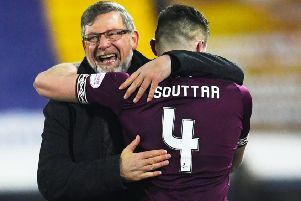 In a party atmosphere at Tynecastle, one strike in each half was enough for a ninth consecutive win after the Championship was won last weekend. Sow stroked the opener with only six minutes played and Ozturk secured victory with a deflected free-kick midway through the second half. The game lacked real intensity for much of the afternoon if the truth be told, but that didn’t bother the capacity home crowd as they acclaimed their now-promoted heroes. The celebrations began with Queen of the South forming a guard of honour as Hearts emerged from the tunnel. Then came a brief delay to kick-off as a plethora of maroon and white balloons were cleared from the field. Six minutes after the first whistle, Sow took Billy King’s pass into feet, outmuscled Chris Higgins and rolled a precise finish into the far corner of the net with his left foot. It was the early goal the fans wanted to kickstart their party. Mark Millar’s left-footed volley on 17 minutes soared high above the Hearts crossbar as the visitors tried to impose themselves on proceedings. They attacked down the left often through the industrious Michael Paton but found the home defence resistant in what was a pretty tame first half. The closest Queen of the South came was when Alim Ozturk dived to head Kevin Holt’s cross clear and glanced the ball narrowly wide of his own goal. In the dying seconds of the first period, Queen of the South’s Zander Clark produced an instinctive save to prevent Hearts scoring again. Jamie Walker’s cutback was nonchalantly backflicked towards goal by Sow, but Clark’s stunning reactions saw him push the ball clear. The hosts had a fortunate escape early in the second half as Queen of the South striker Derek Lyle missed a sitter. Millar’s driven free-kick from 25 yards was parried by Neil Alexander in the Hearts goal. Lyle was on hand to slot the rebound into the net from five yards, but succeeded only in scooping his finish over the crossbar with Alexander grounded. A wild deflection granted Hearts their second goal on 67 minutes. Ozturk stepped forward to strike a free-kick almost 30 yards out. His powerful attempted careered off the Queens wall and spun away to Clark’s left and into the net. The game was over by that point. Queen of the South gave a decent account of themselves in search of a goal but lacked guile or a cutting edge up front. The remainder of the afternoon belonged to the home supporters as they rejoiced in their team’s status as Championship winners.